This new model J&M Elite BT-03 series Bluetooth helmet headset has been designed for installation into most flip-up modular, full-face or open-face style helmets. This headset features our miniature extra-high-output AeroMike® VI boom microphone, slim-line 40mm high-intensity helmet speakers and new full-featured BT-03 Bluetooth control head with easy to install clamp-on mounting system. This helmet headset kit includes all necessary mounting hardware, USB charger/adapter cable, aux input cable and complete installation/operation instructions. 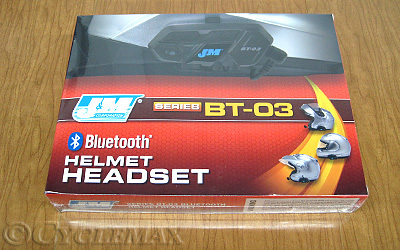 What separates J&M’s Bluetooth® helmet headsets from all the rest? • The audio performance of J&M’s elite series Bluetooth headsets will rival that of our best corded headsets, so you don’t have to sacrifice good sound when going wireless. • Our elite series features the boom style AeroMike VI microphones for the very best in wind and ambient noise cancelling at highway speeds. • Easy to feel and operate external controls for volume up/dn, helmet to helmet linking, multifunction button call answer/initiate/linking and on/off. • Control head features the CSR Bluecore8 module, for easy pairing to most Bluetooth enabled audio devices, including iPhone, Android & Windows Smartphones, Bluetooth enabled GPS units, Bluetooth enabled MP3 and iPod type music devices, along with direct headset linking to specific Bluetooth compatible motorcycle audio systems like the new 2018 Honda Gold Wing, 2014-2018 Harley (with J&M custom dongle or Harley WHIM installed), 2017-2018 Indian Chieftain, 2018 CanAm Spyder & 2001-2017 Honda GL1800 with J&M’s custom dongle. • Multifunctional Bluetooth 4.1 software package includes standard profiles of HSP, HFP, A2DP Stereo & AVRCP, along with the J&M Exclusive helmet to helmet intercom profile. • Up to four headsets can be paired together for crystal clear intercom communications at distances of up to ½ mile. • Control head is powered by a rechargeable Lithium power cell providing 14-18 hours of use from a full charge. • Versatile, easy to install component design to allow removal of the control head for in-house charging away from the helmet. • Periodic software updates are available from the J&M website, via USB download using Windows 7, 8 or 10. You will not find a better performing Bluetooth helmet headset anywhere, you have our name on it.